Roger Norman is a retired lawyer, having practiced estate planning law in the state of Texas for 43 years. He is a 1962 graduate of the University of Oklahoma with a bachelor of arts in business administration, and a 1968 graduate of the University of Texas School of Law. Mr. Norman received Yahshua as his personal savior at age 29. 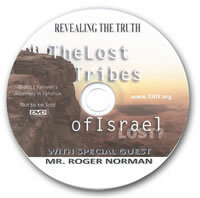 After first hearing about the lost tribes of Israel in the 1970s and examining such to a minor degree, Mr. Norman completely rejected the theory, which holds that today the "lost tribes" constitute the leading nations of the world. In approximately 2000 Mr. Norman began to see in the Scriptures, as opened to him by the Holy Spirit, that the biblical blessings spoken upon the sons of Jacob/Israel could only apply to the modern nations of this world and in particular the United States and Great Britain as having the major blessings. He began to study the subject in much detail and checked out every book he could find, pro and con on the subject at Southwestern Baptist Theological Seminary, Fort Worth, Texas. After becoming thoroughly convinced of the subject he began to teach and share these precepts with others. He has taught a 12 hour course on the lost tribes of Israel through the continuing education Department of Texas Christian University, Fort Worth, Texas, and has taught a six-hour presentation at a feast of Tabernacles gathering. The most recent presentation (four ½ hour programs) was recorded on the Revealing the Truth set at Yahweh’s Assembly in Yahshua in Kingdom City, Missouri. Watch this important 4-program series below or order the DVDs.